Metroid II: Return of Samus Game Boy Game Cartridge Cleaned, Tested, and Guaranteed to Work! I played this just after finishing the 3DS remake. This holds up very well, and I believe every Gameboy owner should play this gem. It is a gameboy game, so it isn't exactly the most advanced, but I have to admit that it's my favorite metroid game so far. Highly recommended. The metroids are a bit too brainless. battles are a bit sloppy and not the best. the maze is more set into areas so it's not as easy to get lost and not as much backtracking as super metroid. but this is very fun game to play especially considering it was made on a gameboy.shame they never remade it. Adding colour and changing the metroid battles a bit would make this one of the best games ever. but it still sits at one of the best gameboy games at least. My ultimate favorate game in the metroid series! 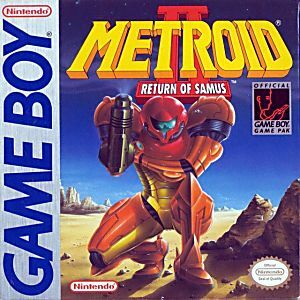 This game shows off the true power of the gameboy and is a must play for any metroid enthusiast. Its no Super Metroid but its still a great game! The game that got me into the series. And if I'm not mistaken the first game I ever played for the Game Boy. At the time I first played this game I hadn't played the original Metroid for the NES. After playing this game I definitely wanted to try that one. Metroid II picks up some time after the end of the original Metroid. The Galactic Federation has sent two expeditions to the planet SR388 where the Metroids were first discovered. The first was a scientific expedition that was never heard from again. So the Federation sent a rescue team but they were also never heard from. Concerned, the Federation dispatched Samus Aran to SR388 to exterminate every last living Metroid. The gameplay is much like the original and indeed this game introduuces one of Samus' coolest suit upgrades to be seen in future titles, the Spider Ball. Your goal is to explore SRc88 and destroy every Metroid you find. Be careful though. Metroids come in a variety of shapes and sizes each more dangerous than the last. This game also introduces an interesting way to progress one that's never seen again so far as I know. You will of course find yourself backtracking frequently when you get a new upgrade but there's another twist. Each area of the planet has a set number of Metroids for Samus to find and destroy. Once all the Metroids in a given area have been destroyed there's an earthquake which, strangely enough, will remove an obstacle that prevents passage to the next area. The audio is something of a mixed bag. There are a few tunes that you'll hear throughout the game and these are quite catchy. But then there are several tunes that, rather than being actual music, are collections of sound effects that loop. There's one of these "tunes" for each major area of the game. Then of course for the final area there's a deep, ominous tune that builds up the suspense to the final confrontation. Sound effect wise the game gets the job done. Each of Samus' weapons has its own distinctive sound. There also differennt sound effects for some enemy attacks. Gameplay wise this isn't going to be a game you can complete in a single sitting. You're going to have to explore every nook and cranny to find that last energy or missile expansion. All in all this is definitely a game well worth adding to your collection. I remember playing this game as a kid on my gameboy. Spent hours combing over every inch of it to find everything. Probably spent to much time. Best part is the game has aged great. This game still holds up well to the metroid name. I'd suggest this for anyone who's got an old gameboy around or has a Super Game Boy for the SNES like I do. Side Scroller. It's Much Like The Nes Game But With Some Improvements. You Play As Samus Trying To Make Your Way Deaper In The Planet Killing All The Metroid Creatures. Very fun game for the classic Gameboy. Also a very underrated game. For what it is though, it is one of my top best Gameboy game of all time! This is a great game. When playing it you can see where some of Super Metroid's features were inspired. Of all the GB games I tried on my Super GameBoy, it's the best looking one. And it's quite fun to play. It pains me when people overlook this game and go as far as to not even count it as part of the Metroid series. I dont see why the general Metroid fanbase doesnt seem to enjoy this game. Its music wasnt written by Kenji Yamamoto, who did almost every other Metroid games music. But the gameplay and levels and whole story is what makes it worthwhile. Definitely not the worst in the series (that goes to Metroid: Other M). Came in excellent condition and worked without a flaw. Doesnt look used the slightest bit. This game shouldn't be forgotten. Metroid II Return of Samus is the least known of the series. But in some ways, it's even more the godfather of newer 2d Metroid games then the original, as it was the first ever on a portable console. While true it lacks some modern developments like an in-game map, and even on the Game Boy color it is a little dull in appearance, this game is loads of fun, and has a lot of awesome features. Among these is one that I wish they would bring back into newer games. Metroid 2 is (to my knowledge) the only 2d metroid game to feature the spider ball, a variation of the morphball which can climb up walls. Exploring with this is lots of fun, and lets you find many secrets. This unsung member of the Metroid series is wonderful, and could only be improved by adding features that were unavailable when this game was made. I completely recommend that Metroid fans pick this game up, it's a real treat, and a shame that more people don't play it.